England looked like potential European champions in the opening half of their debut match against Russia. They passed the ball around quickly and had Russia under constant pressure but were unable to find an opener as Adam Lallana missed two opportunities and Harry Kane narrowly missed out when stretching for a Dele Alli ball. The second half continued in much the same way, with the first opportunity seeing Wayne Rooney force a tremendous save from Igor Akinfeev. It fell to young Eric Dier to break the deadlock though as he smashed home a free kick from 20 yards, but the replacement of Rooney with Jack Wilshere proved to be a fatal mistake. England relinquished control of possession with Rooney’s removal from the midfield, which led to a spell of Russian dominance. Two minutes from time they were made to pay as Russia captain Vasili Berezutski headed in a dramatic equaliser. While many of the reports will focus on the dreadful scenes off the pitch, it was an excellent display in every department but finishing from England. However, if they can improve their finishing they are in with a great chance of making a deep run at the competition. This was just their 3rd failure to win in their last 13 matches, with the other two being defeats to Spain and Netherlands. During this time they have dramatically beaten Germany and got wins against France, Turkey, and Switzerland among others. Wales returned to a major international tournament for the first time in 58 years, and they couldn’t have hoped for a better start. Gareth Bale smashed a 30 yard free kick into the net just ten minutes into the game and the Welsh team continued their impressive performance throughout the first half. They closed the ball down exceptionally quickly and maintained a very high work rate throughout. Marek Hamsik proved to be Slovakia’s only real threat, with him coming very close to opening the scoring just three minutes in, but he was denied by a last ditch clearance from Ben Davies. It was anybody’s game after that, but eventually it fell to another substitute, Hal Robson-Kanu, to scuff in the winner nine minutes from time. What Wales lack in quality they more than make up for in work ethic and determination. Their wing backs were relentlessly energetic and never gave Slovakia any time on the ball. It will be interesting to see whether the increase quality of the England midfield can cope with this non-stop pressure any better. I think both defences will struggle to contain the opposition. 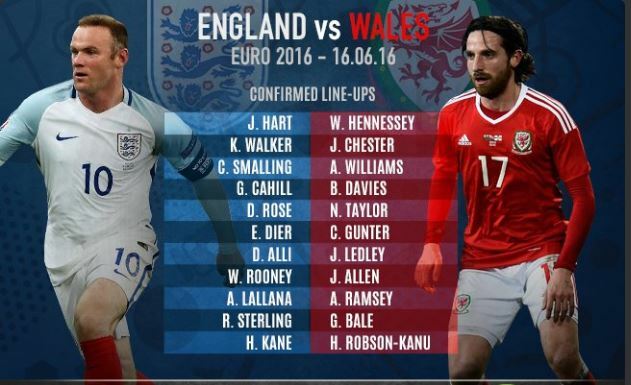 Gareth Bale has the quality by himself to tear apart any defence in the world, and with Aaron Ramsey feeding him balls I’m expecting them to find the net against England. Wales have scored in seven of their last 11 games too, so they definitely have the form for it. England have conceded in five of their last six matches as well, but to be fair to them they have scored in each of their last seven and only failed to find the net once in their last 13 games, whilst Wales have conceded in each of their last five games. This makes odds of 2.2 for Both Teams to Score look very good value for money, so that’s what I’m backing as my main tip. England have won eight of their nine meetings with Wales and have never lost to them, but the last meeting was in 2011. England have seen both teams score in 83% of their last six matches.